Identity is a complex and layered topic. As odd as it may sound, a brand’s identity can be just as complex and layered. Brands are like people. A brand starts as an idea, blossoms into something tangible and evolves over the years. Just like people, brands have a story to tell; a personality; a lexicon; and a set of experiences that entice engagement or action from an audience. Brands are meant to serve a purpose, which is communicated through design. Design is a critical component of any brand, but it’s not what makes a brand, a brand. But how can one understand brand identity through design? What does this mean? Let’s step back for a moment and think about our identity. Human identity is comprised of several different factors. On the surface, people express their personality and individuality through clothes, hairstyles or makeup – showing how they’re different, or in some cases the same. The reasons people choose to express a particular ‘look’ could come from any number of things; like upbringing, or where and how a person was raised; culture and in some cases religion; ethnicity, education, social groups, peer-pressures, values, moral beliefs, and on-and-on. Personal attributes are the foundation of our ‘personal brand’. Combine these attributes with how we express ourselves on the surface, and we have a unique identity. In a sense, a brand is no different. There are surface elements such as a logo, a set of colors, type treatments, etc., and then there are the underlying attributes that form the brand identity. Brand attributes outline the purpose and reasons as to why and how design will be used to communicate the brand identity. From this point, when people start to interact with a brand, they begin to make certain assumptions and or judgments, perhaps even understand or relate to, a brand’s identity through their design system. To illustrate this point, here are the foundational elements that help form the brand identity and the makings of a brand design system. Developing a brand identity strategy is the first step to creating a brand. This is where research, data, and audience analysis are distilled into a brand direction. The intended outcome is to define your brand purpose. 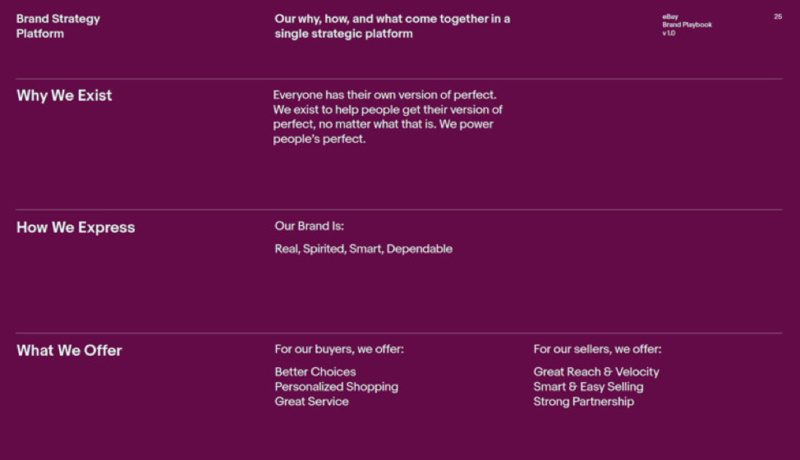 A good brand outlines their reason for being, how their unique, and what they promise to deliver. The essence of the brand strategy – purpose (why a brand exists), positioning (what we offer), and experience (how we express the brand) is used to direct the design. The basics of any design system includes: photography, typography, colors, logo, and tone of voice. Photography styles are chosen to show brand personality and help tell a story; to connect to customers; and in some cases, to help sell a product. In eBay’s case they use experience, portraiture, product and detail photography to support what they offer as a brand and why they exist. Typography helps classify a brand. Is the brand playful, serious, traditional? Typography treatments are another way for a brand to show personality. In the case of eBay the typography that was selected is intended to reflect the friendly and approachable nature of the brand. 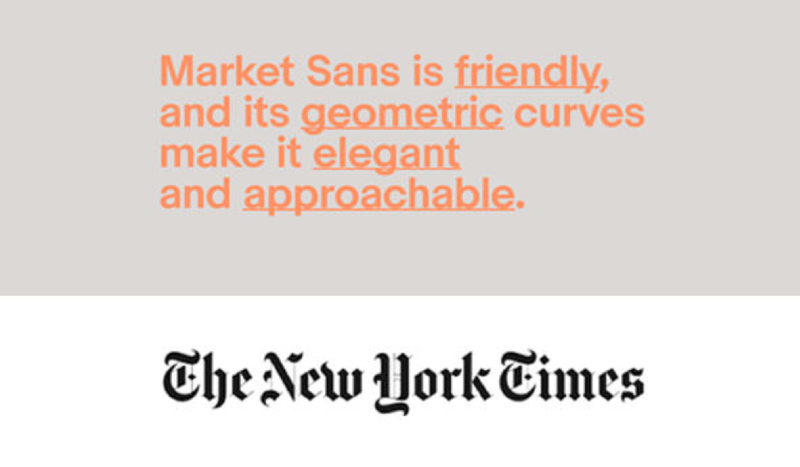 When comparing the eBay type treatment with the New York Times, the friendly type treatment is more obvious. 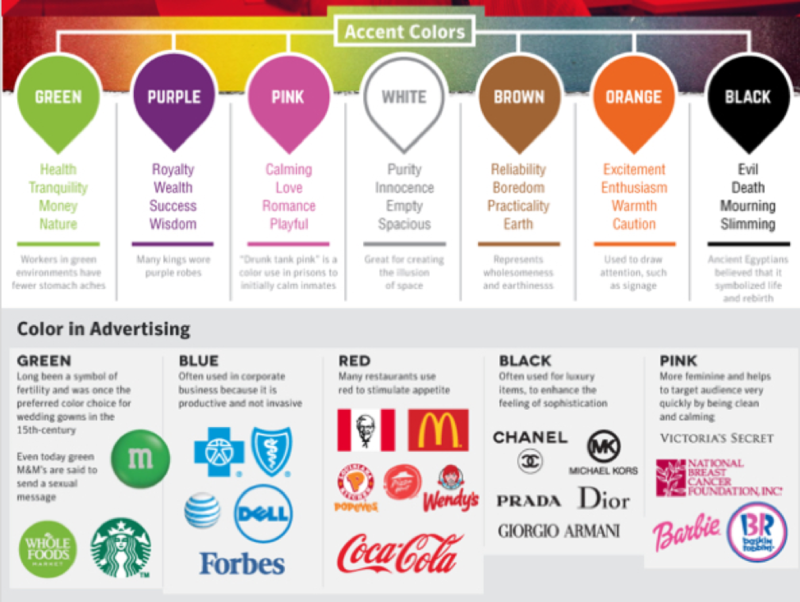 Color is an important component to a brand identity. Several studies have been done that shown the effect colors have on people, especially when it comes to decision making. 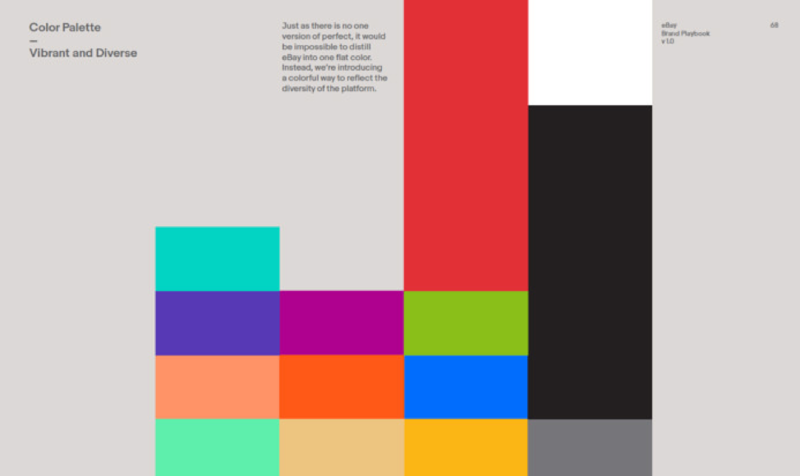 This explains why we tend to see specific colors associated with specific industries. 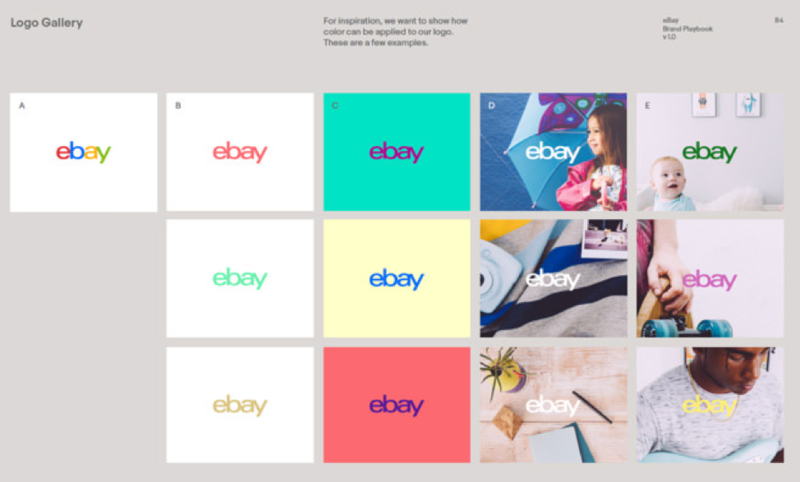 eBay chose colors to represent a diverse community and range of products. 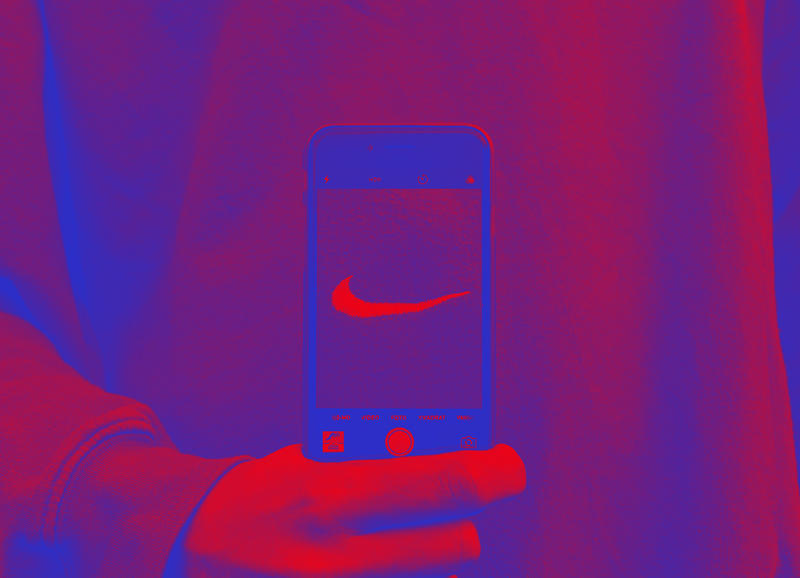 The colors used incorporate the traditional eBay colors, while allowing the brand to evolve with new and refreshing colorways. The logo is used as an identity marker in a brand system. In many cases it’s the brand logo that people remember the most and equate to a brand. Logos represent different brand attributes in different ways. eBay wants to show diversity and versatility. Roxy: going after a female audience the heart and connotation of a female organ. 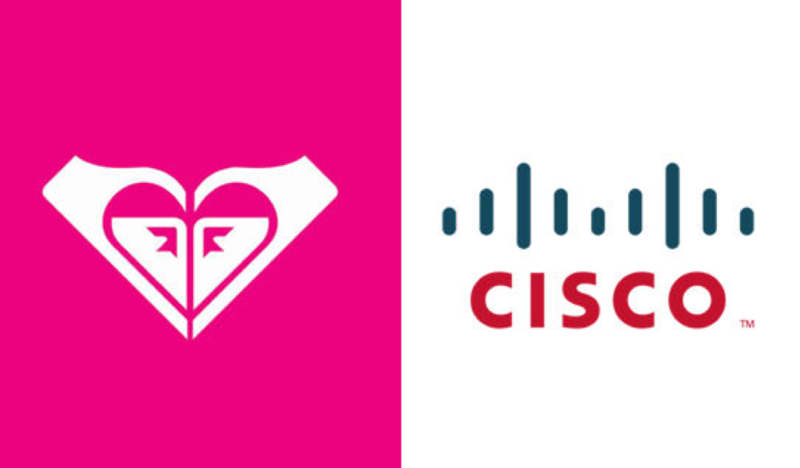 Cisco: sense of pride in where the company was founded and the electromagnet core. 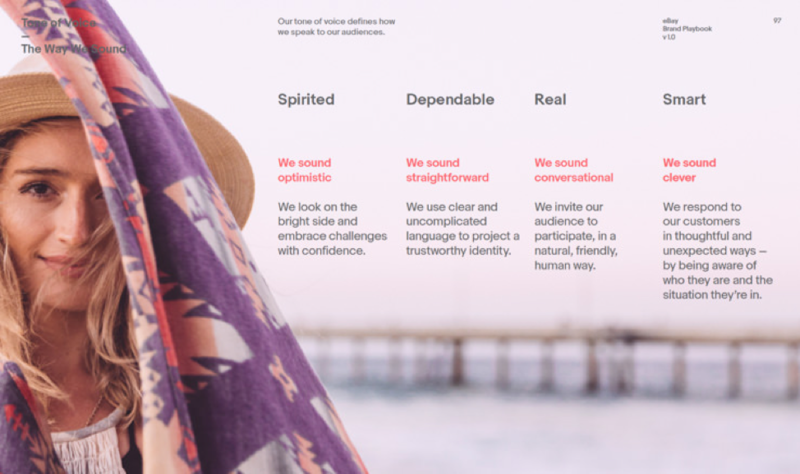 The tone of voice helps solidify the visual messaging of the brand. 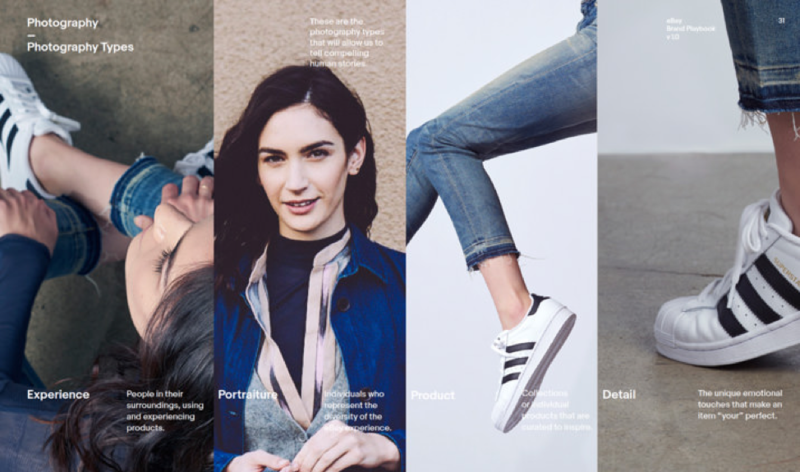 In eBay’s case the brand attributes of, spirited, dependable, real, smart are communicated through each key component of the brand’s identity system. These are just a few examples of how to understand a brand’s identity through design and how a design system starts to take shape across a multitude of channels and formats.